Victor Valle, a professor in the Ethnic Studies Department at Cal Poly who was part of a Pulitzer Prize-winning team of reporters at the Los Angeles Times, has been named a fellow at Harvard University’s Radcliffe Institute for Advanced Study for the 2011-2012 academic year. Valle, 60, will dedicate his time at Radcliffe to researching and writing his next book, “The Poetics of Fire: On The Art of Chile Eating,” a blending of cultural history, memoir and aesthetic philosophy that interprets North American aficionados’ love of the chile. A leader among the world’s institutes for advanced study, the Radcliffe Institute at Harvard annually selects fellows, who are award-winning artists, academics and professionals, including musicians, mathematicians, filmmakers, anthropologists, biologists and writers, to focus on individual projects and research. Among his published works, Valle’s 2009 book, “City of Industry,” won critical praise for its look at Industry, a suburb of Los Angeles, where Valle examined the corporate privatization of the state’s redevelopment industry and how it contributed the inequalities of wealth that characterize Southern California’s urban landscape. In 1984, Valle, then a reporter at The Times, was part of a team of Mexican American reporters and editors who produced a three-week series of stories on the lives and accomplishments of Latino residents of California’s 13 southern counties. The series earned The Times the Pulitzer Prize Gold Medal for Meritorious Public Service, making the reporters and editors the first Mexican Americans to win a Pulitzer. 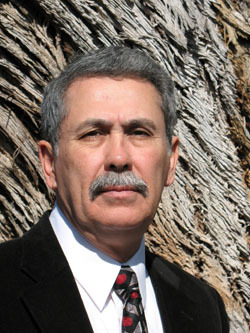 Valle joined Cal Poly’s Journalism Department in 1992, and transferred over to its Ethnic Studies Department in 1995, the department to which he will return after the completion of his fellowship. I met Victor when he first came to Cal Poly and he was full of ambition, but — in my humble opinion — Cal Poly taught him that compliance with authority was more important than personal achievement. If Victor had any real faults, I believe it was caring too much for what his ‘colleagues’ thought of him and fearing that he might become a ‘pariah’ among the Cal Poly faculty if he didn’t go along…. eventually, he was sent to the intellectual dungeon of Cal Poly… Ethnic Studies, which I am not sure if it was his choice. Personally, I hope he is happy in his new location. Based on his polyratings, it’s obvious that he had time to write books and grants proposals because he did not give a crap about teaching. Definitely a role model for the new calpoly. Sounds like he’ll be needing a promotion when he returns. If this guy really wanted to connect the dots and figure out what caused the “inequalities of wealth that characterize the Southern California’s urban landscape,” maybe he should write his next book on how highly paid public academic elites blow money that was forcefully taken from someone else to study how their favorite fruit effects culture, “crowding out” expenditures by private companies who provide jobs and create wealth through customers who voluntarily do business with them. So, it is only the well-paid academics who are causing the problem? High-paid local government leaders, as is in the City of Industry, is a-okay with you? This is how bad it is in Industry: they are going to be forced to unincorporate since the city was operated like a crime family and not a city. Valle was a key player in the exposure of the City of Industry for its criminal cronyism, including absurdly high salaries (especially for the city government–they are worse than the City of Bell). He has earned every accolade and penny he has received in pay. VERNON, not Industry! Get your facts straight before looking foolish. Ask the students if high paid academic morons causing tuition increases is okay with them. This guy is getting rich writing whimsy books on tax payer money. He’s a criminal in my book, except it’s US who are dumb enough to underwrite him. “Pulitzer prize” = politically correct prize. A sham prize bestowed by a self-aggrandizing group of correctness pushers. What I want to know how much money was given as a grant (see free taxpayers money) for this life saving, humanity changing, make mankind better endeavor?